CHICAGO, Feb. 11, 2019 /PRNewswire/ -- Assan Alüminyum's Managing Director Göksal Güngör has been re-elected to serve for a two-year period as the President of Global Foil Roller Initiative (GLAFRI) during the 5th Global Aluminum Foil Roller Conference (GLAFCO) in Dubai, UAE. Mr. Güngör has been serving on the board of GLAFRI since 2016 and has served as the president since the beginning of 2018. 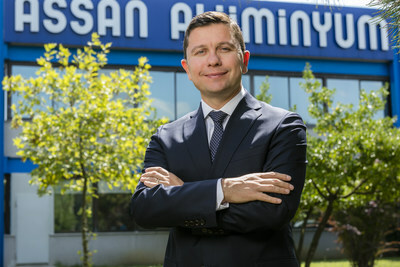 Assan Alüminyum, one of the 61 members of GLAFRI, is one of the leading aluminum foil producers in Europe, with its aluminum foil production capacity reaching up to 100 thousand tons per year. Mr. Güngör emphasizes the fact that Assan Alüminyum makes its future strategic plans based on its sustainability motto of 'Producing the Future without Wasting It'. "The only way to preserve the environment for future generations is through a responsible and sustainable production approach. Therefore we produce renewable energy in our own production facilities, at a rate that is equivalent to our annual electrical energy consumption. Additionally we also process internal and external aluminum scrap in our integrated recycling facility. We are therefore able to reduce our overall carbon footprint as a result of these activities," said Mr. Güngör.